In 1997, the Welsh electorate voted (narrowly) in favour of devolution for Wales. Devolution is when certain powers held by the UK Parliament are transfered to Wales (as well as Scotland, Northern Ireland, Greater London and some other English city regions). The total list of powers is called a “devolution settlement”, with the latest settlement outlined in the Wales Act 2017. 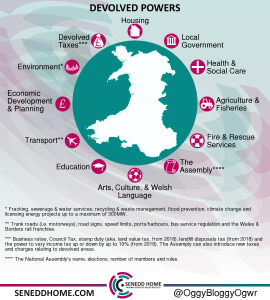 Since 1999, the National Assembly for Wales and the Welsh Government have been responsible for these devolved areas and, following another referendum in 2011, also have the ability to make new laws affecting devolved areas. The National Assembly (aka. Senedd, Welsh Assembly) is a democratically-elected parliament made up of 60 Assembly Members (AMs). Their role is to represent constituents, make sure the Welsh Government are running devolved services properly (by asking questions and undertaking committee inquiries), as well as making changes to new laws. The Welsh Government is responsible for running devolved services in Wales, with Cabinet Secretaries appointed to control government departments. They’re led by a First Minister who’s been approved by the National Assembly and then appointed by the Queen. Wales receives a “block grant” from the UK Treasury to pay for devolved services and from 2018 will raise some of this money from devolved taxes. The Welsh Government and National Assembly decide how this money is spent and in total it amounts to £14-15billion a year. Any powers not devolved to Wales are known as “reserved powers” and continue to be funded, regulated and run by the UK Government and UK Parliament in London. Reserved powers include: defence, foreign policy, policing, courts, prisons, taxes that haven’t been devolved to Wales (i.e VAT, national insurance), welfare/benefits (i.e state pensions), rail infrastructure (i.e. tracks and stations), big energy projects (i.e. nuclear power stations), currency, financial regulation and the constitution (i.e. the monarchy, referendums).